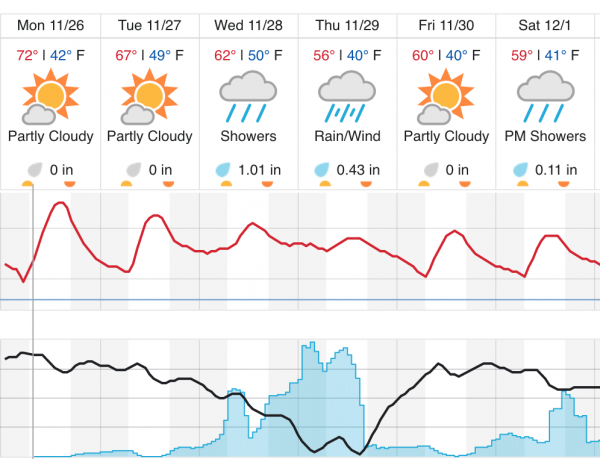 –Weather Underground is predicting a 58-percent chance of rain for Atascadero Wednesday, which rises to a 98-percent chance of rain on Thursday and a 53-percent chance of rain again on Saturday. Monday’s expected high is 72-degrees, but temperatures are expected to drop down into the 60s and even the mid-to-upper 50s later in the week. To view the current weather forecast, click here.